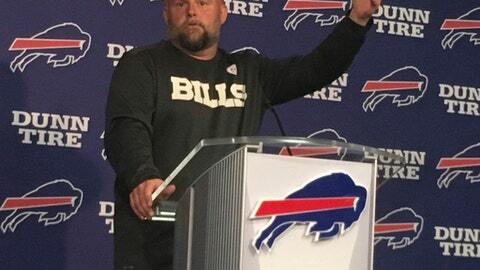 ORCHARD PARK, N.Y. (AP) Brian Daboll has far too much on his plate to have time to reflect on how the Buffalo Bills new offensive coordinator’s career has brought him home. There’s a new series of plays to install, players to evaluate and, most important, a new young hope at quarterback in first-round draft pick Josh Allen to groom. So forget asking Daboll what it’s like to be working with the team he grew up in suburban Buffalo rooting for, or being on a staff headed by Sean McDermott, the former safety whom Daboll coached at William and Mary in 1997. ”Just day by day,” he said in addressing reporters at the Bills facility for the first time since being hired in January. And on Thursday, Daboll’s past was nowhere near the forefront of his attention. ”No. I’ve got my two-minute in my mind right now,” he said, referring to having his offense run the two-minute drill in practice for the first time this spring. The 43-year-old is entering his 18th NFL season and 22nd overall, including college. It’s a career in which Daboll has won five Super Bowl titles as an assistant during two separate stints with the New England Patriots. And he’s coming off a season in which he oversaw a run-heavy Crimson Tide offense that helped Alabama win the national title. The championship experience was re-affirming for Daboll in proving he can adapt the offense to a team’s strengths while also gaining a better appreciation of dealing with younger players. It’s a lesson that will certainly carry over to Buffalo, where Daboll takes over an offense essentially rebuilding from scratch, with the exception of veteran star running back LeSean McCoy. Buffalo’s undergoing yet another switch at quarterback after third-year starter Tyrod Taylor was traded to Cleveland in March. There’s a three-way competition for the starting job led by Allen, the raw strong-armed rookie out of Wyoming who was selected with the seventh pick in the draft. It’s rounded out by AJ McCarron, who spent his first four NFL seasons as Andy Dalton’s backup in Cincinnati, and second-year player Nathan Peterman. The offensive line is in transition after losing three starters. And the receiver position lacks established depth behind Kelvin Benjamin. Benjamin said Daboll is putting the onus on the offensive veterans such as himself, McCoy and tight end Charles Clay to lead by example. Daboll said it’s premature to project who will fill out the starting jobs, and that particularly includes quarterback. McCarron and Peterman are splitting time with the starters, while Allen, for now, is working with the third stringers. Allen’s inconsistencies were apparent during the two-minute drill. He telegraphed his third pass, which was intercepted by cornerback Breon Borders. During his second chance, Allen completed five of seven attempts, including one dropped pass, and capped the drive by hitting Cam Phillips in the right corner of the end zone. Daboll is Buffalo’s fifth coordinator in five years. He replaced Rick Dennison who was fired after one season in which the Bills finished 29th in yards – mostly because of a popgun passing attack – and 22nd in points. Daboll was actually born in Welland, Ontario, just across the river from Buffalo. But he quickly relocated to West Seneca, New York, where he was brought up by his maternal grandparents and developed a passion for football and the Bills. NOTES: TE Logan Thomas will miss the final two weeks of spring practices after having surgery to repair a minor knee injury. … The Bills have four voluntary practices next week, and then hold a three-day mandatory minicamp from June 12-14.